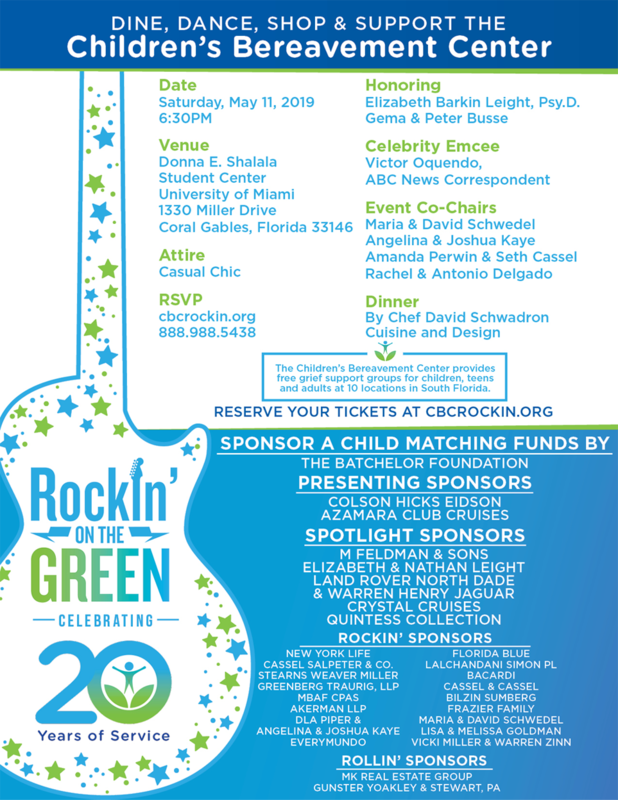 Join us, and over 500 guests, on Saturday, May 11, 2019 at the University of Miami's Shalala Student Center, to celebrate 20 years of the Children’s Bereavement Center! Highlights of the evening include a delicious catered dinner by Chef David Schwadron, live music and exciting auction items! We will also honor a few exceptional people who are true leaders in the community. Table sponsorship is available; contact our Marketing Director, Katelyn Gimbel, for more details at 305-423-6001 or katelyn@childbereavement.org. With the help of our friends and supporters for the past 20 years the Children’s Bereavement Center (CBC) has provided free grief support groups for thousands of people, empowering children, teens, adults, parents and caregivers to build resilience and hope after the loss of a loved one. The CBC is now serving Miami-Dade, Broward and Palm Beach counties at 10 sites, in collaboration with VITAS Healthcare. We hope you will join us at Rockin' on the Green May 11th!